Big news from Stromberg. The new 97 boasts a 250 cfm rating! This is good news for hot rod enthusiasts everywhere. There are some obvious advantages for the over head valve multi-carb crowd, but the hallowed flathead has just got a big boost as well. If you have ever calculated your CFM for your hopped up motor you will have noticed a gap between what a single carburetor could deliver and what a dual carburetor would deliver. It seemed like too much or not enough for a mild street motor. Well Stromberg just closed that gap. Got a bored motor with a merc crank and a cam? 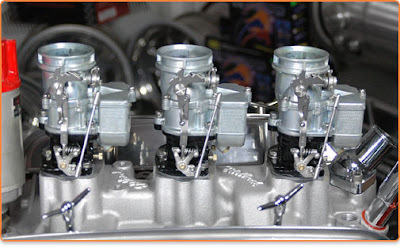 You can now have the classic good looks and reliable vintage speed equipment in a bolt on carburetor. Well played gentlemen, well played.